If you have any questions or suggestions you are welcome to join our forum discussion about Three-Bar Reversals. Having covered to some extent the double-candle reversals in the previous article, now it is time to turn our attention towards the triple-candle ones. A triple-candle reversal is just a variety of the double-candle reversal. It is comprised of three candles, with the first and the third ones being basically the elements of the double-candle reversal, while the middle one is very small and might even be a doji. 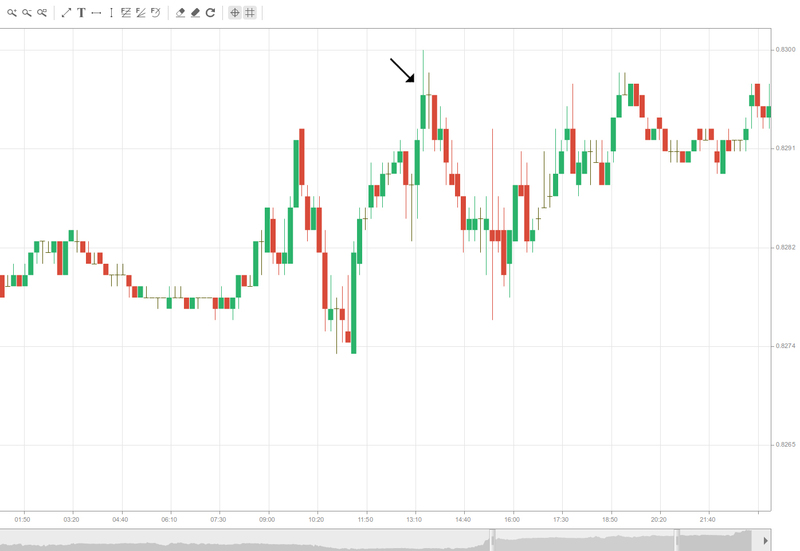 Just like the double-candle reversal on a 5-minute chart is visualized as a reversal candle on the 10-minute chart, a triple-candle reversal creates a reversal candle on the 15-minute time frame, if their closes match. 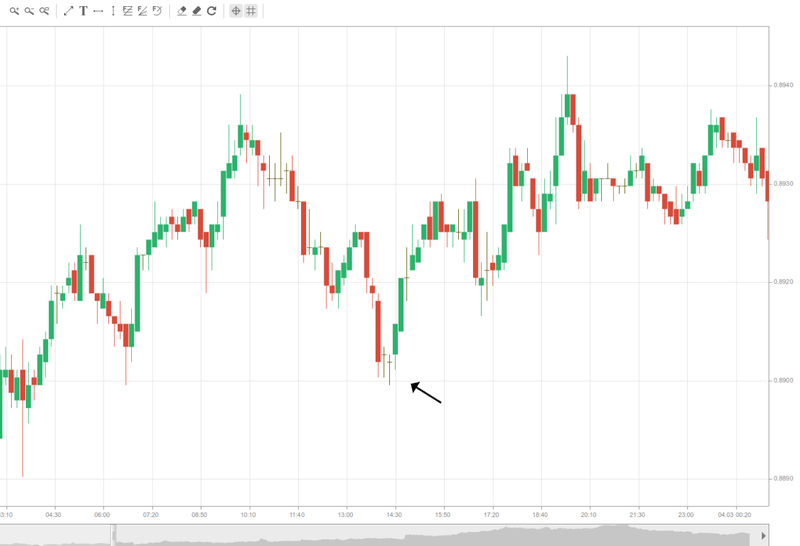 As soon as the third candle closes and forms the 15-minute reversal candle, it would be followed by additional market players who are trading on the 15-minute time frame. This should make you more confident about your trade, because a reversal signal on a higher time frame implies a larger move, thus allowing you to aim for a wider profit target. However, many experienced tutors suggest triple-candle reversals should be traded as double-candle reversals and disregard whether they are creating a solid 15-minute reversal candle or not. Below you can see a three-bar reversal on a 10-minute graph made up of a doji bar between the two outer bars. You should keep in mind that although 15-minute reversal candles can be seen on 5-minute time frames and a match between their close levels generates a stronger signal, some triple-candle setups on the 5-minute charts do not result in good reversals on the 15-minute chart. As we mentioned above, a reversal on a higher time frame usually leads to a larger move, which should make you more confident to widen your profit target when you are trading on the lower time frame. Moreover, it is also worth considering to look for a trend candle that is followed within the next several bars by an opposite trend candle, whose close is near the open of the first one and forms a reversal. This setup will look like a double-candle reversal on a higher time frame and a reversal candle on an even higher time frame. However, the opposite is not always true. Some triple-candle reversals on the 5-minute chart do not create optimal reversal candles on the 15-minute time frame, because the pattern’s third candle closes for example at the hour’s 20th or 25th minute, instead of the 30th minute. When this occurs, the larger time-frame signal does not show the same strength as the triple-candle pattern, which means that you won’t benefit from the inflow of traders who trade off the 15-minute chart like in the previous case. However, as we’ve already said, traders should not waste too much time looking for the perfect triple-candle reversals, which build up a 15-minute reversal candle, because that pattern may only occur as rarely as a couple of times per day. Spending so much time in search of those would cause you to miss other more common setups, such as double-candle reversals. After all, your ultimate goal is to clearly spot each suitable price reversal and be able to take advantage of it, once you believe there will be a follow-through, and not just pursue more complicated setups and miss on profit opportunities. There are also other variations of the double-candle reversal setup, such as four-candle reversals, but they should also primarily be regarded as double-candle reversals. Although it is not the perfect example, below you can see a four-bar reversal made up of two doji bars in the middle.